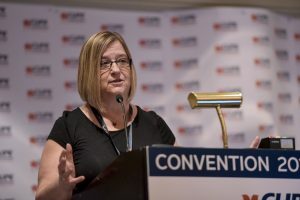 In addition to her role as Treasurer, Judy Henley also serves as a CUPE SFL Vice-President, and as a CUPE National General Vice President since June 2017. Sister Judy Henley is a health care worker and has been a CUPE member since 1982.
Henley is a member of CUPE Local 5430. CUPE Saskatchewan is a provincial division of the Canadian Union of Public Employees, and acts as the political voice for CUPE locals in Saskatchewan.